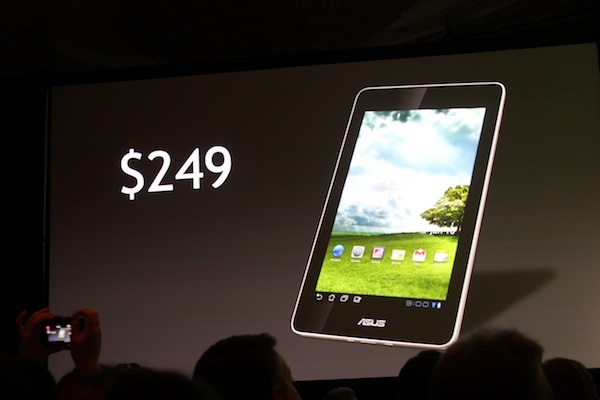 Asus and Google rumoured to partner on a $199 7-inch Tegra 3-powered Nexus tablet, Google Play? Apparently Google was so impressed with Asus’ $250 7-inch Tegra 3-powered MeMo 370t at CES in January that it wants to partner with the manufacturer to create a cheap Nexus tablet. These rumours are unsubstantiated but make sense in the wake of Amazon’s Kindle Fire, arguably the only truly successful Android-based tablet in terms of sales figures. While Samsung, Asus, Acer and a number of other OEMs languish in the thousands or tens of thousands in sales, the Kindle Fire has sold millions, largely due to Amazon’s US-only content ecosystem. But Google has been expanding its own content beyond apps, to books, movies and, in the US, music. It also has control of the software, which means any Nexus-certified tablet would be running the latest version of Android and receive updates directly from the source. Asus has also been quite successful with its Transformer series, though the latest batch are aimed at the mid- to high-range market. The rumour extends to the fact that Google’s Andy Rubin and Eric Schmidt have both remarked on how the company is to take Android tablets more seriously this year, and while there is no indication of what that means outside of releasing a unified Android build in Ice Cream Sandwich, it would lead us to believe some sort of Nexus tablet is going to emerge. The $199 price point could be achieved by lowering the amount of internal storage of the 7-inch tablet and perhaps reducing its external ports to the bare minimum, creating a direct Kindle Fire competitor. The likelihood of a Google tablet increased recently when it was revealed that several domain names have been purchased, hinting at a device called Google Play — googleplaygames.com, googleplayapps.com, etc. — though we can’t be certain if the buyer is Google or just some enterprising third party cashing in on Google’s brand strength. It would be a bit strange of Google to launch a device called Google Play since none of the Nexus devices have had Google in the name. The Asus MeMo 370t is supposed to be released later this year with a Tegra 3 processor, a 7-inch 1280×800 resolution, 16GB internal storage and an 8MP camera, running Android 4.0. While it’s not the most attractive slab we’ve ever seen, if Google can work its magic on the software and the price, this could be the first truly successful Android tablet.